Click the Configure link for Table Metrics. 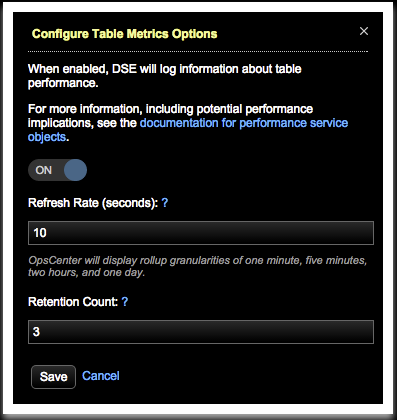 The Configure Table Metrics Options dialog appears. Enter a Refresh Rate in seconds that specifies how often DataStax Enterprise updates info in dse_perf tables. Setting the refresh rate to 60 seconds or greater is recommended to match the minimum default frequency at which OpsCenter collects and aggregates metrics data. Enter a Retention Count value that specifies the number of snapshots retained at any given time.